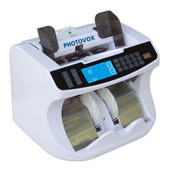 Banknote counter Ph123 available in 3 versions to suit your needs. Counts your banknotes and performs a validity check using U.V. sensors. Evaluate your banknotes and recognize them by denomination and by value both total and sub-total. Controls validity using multiple controls: Size, Magnetization, Ultra-violet, Infra-red. .